The Global Volcanism Program has no activity reports for Chyulu Hills. The Global Volcanism Program has no Weekly Reports available for Chyulu Hills. The Global Volcanism Program has no Bulletin Reports available for Chyulu Hills. The 100-km-long NW-SE-trending Chyulu Hills volcanic field is located 150 km E of the Kenya Rift. It contains several hundred small cones and flows, including numerous recent cinder cones. Two of these, Shaitani and Chainu, erupted during the mid-19th century. Volcanic activity began about 1.4 million years ago with eruptions in the northern Chyulu Hills and migrated to the SE, where a large number of Holocene cones are found. Many of the cinder cones are aligned along dominantly NW-trending older faults and younger NNE-trending fissures. The silica contents of the lava flows increased with time. Early flows consisted of foidites; later Holocene lava flows are basanites and alkali basalts. Haug G H, Strecker M R, 1995. Volcano-tectonic evolution of the Chyulu Hills and implications for the regional stress field in Kenya. Geology, 23: 165-16. Saggerson E P, 1963. Geology of the Simba-Kibwezi area. Geol Surv Kenya Rpt, 58: 1-70. Spath A, Le Roex A P, Opiyo-Akech N, 2001. Plume-lithosphere interaction and the origin of continental rift-related alkaline volcanism--the Chyulu Hills volcanic province, southern Kenya. J Petr, 42: 765-787. There is no Deformation History data available for Chyulu Hills. There is no Emissions History data available for Chyulu Hills. 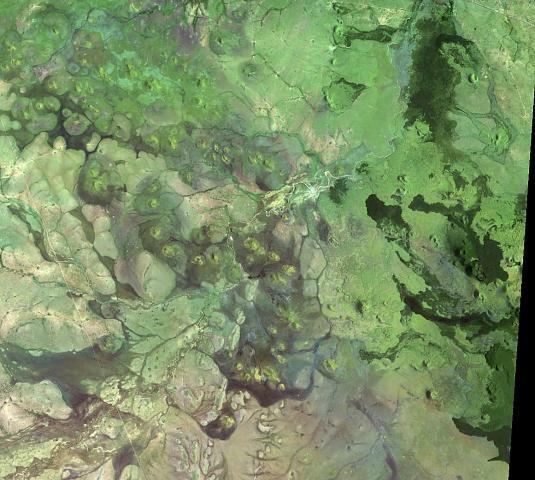 The dark lava flows at the right side of this Landsat image are from vents at the western end of the Chyulu Hills volcanic field. This 100-km-long, NW-SE-trending volcanic field is located 150 km east of the Kenya Rift. Two of the several hundred small cones and flows, Shaitani and Chaimu, erupted during the mid-19th century. Many of the cinder cones are aligned along dominantly NW-trending older faults and younger NNE-trending fissures. There are no samples for Chyulu Hills in the Smithsonian's NMNH Department of Mineral Sciences Rock and Ore collection. Large Eruptions of Chyulu Hills Information about large Quaternary eruptions (VEI >= 4) is cataloged in the Large Magnitude Explosive Volcanic Eruptions (LaMEVE) database of the Volcano Global Risk Identification and Analysis Project (VOGRIPA).